The Bill of Rights Defense Committee submitted a letter on behalf of 46 partner organizations to the Senate Judiciary Committee yesterday calling for more oversight over the FBI. Shahid Buttar of the BORDC provided an update in the post about the hearing today, discussing the questions asked about how widely FBI agents had cheated on tests about their spying powers. FBI Director Mueller was pressed about racial and religious profiling, and he reportedly erred in his claim regarding whether agents are allowed to initiate surveillance only based on suspicion of wrongdoing at this time, while conceding that FBI surveillance is not limited by suspicion after the hearing within a note. As usual, it appears that the BORDC is the place to go and the people in the know about this sort of civil liberties activism. Always our pleasure to help them out, and if we can swing it, our community should work to streamline social media strategies that can be utilized to support these projects and the issues at large. Seems like another conference call would be at least one useful next step to take, and here is a doodle poll where you can let us know what times you could make it! Today we celebrate not the 234th anniversary of the birth of this nation, of our declaration of independence—that was two days ago on July the 2nd, the date that the Continental Congress unanimously passed Mr. Richard Henry Lee’s resolution of independence, the day on which the United Colonies of America became the United States of America. No, we celebrate the 234th anniversary of the publication of the formal text stating the reasons for that independence. We celebrate not the act but the explanation, not Independence but the Declaration. Today we celebrate the power of words, of ideas, of reasons and reason. The great acts were on April 19th, 1775, which is commemorated as Patriots Day only in the Massachusetts, our offspring state Maine, and for the past decade, the state of Wisconsin, and July 2nd, 1776, which is not to my knowledge celebrated, despite John Adams’ prediction. The precise words of the Declaration and their history has been in the news lately as modern technology has shown what has been long suspected, that while writing the rough draft, Jefferson obliterated the word “subjects” and replaced it with “citizens”. This change along with several others shows how new the ideas in the declaration were, how even the authors of the document, among the most eloquent speakers and writers of their day struggled to overcome the linguistic conventions of the ideas and mindset that they were overthrowing. Jefferson was obviously having trouble shaking off the styles of monarchy, of thinking of, or at least referring to the King as “his Majesty” and the people as his subjects. His original phrasings presume that authority flows down from God to King to subject to slave, but the very words of the document declare that “governments are instituted among men, deriving their just powers from the consent of the governed”, who in turn are “endowed by their Creator with inherent & inalienable rights” in the words of the draft. Jefferson and the Founders were in the process of standing the social order on its head. No longer did authority come from the divine right of Kings, but from the natural rights of the people, the governed. This was a whole new theory of rights, authority, government and law. This mistake of thinking in terms of authority deriving from the inherent power of those who govern is still made today, in the pages of our newspapers, the seat of our government and the maunderings of our pundits. It was not long ago that the Attorney General of the United States made the deplorable assertion in sworn testimony before Congress that “there is no expressed grant of habeas in the Constitution” as if the Constitution grants rights to the people rather than ceding the power of the People to the government. How often do we hear the President referred to as “Commander in Chief of the American People” as if he has the right to command, rather than being the servant and tool of the people? How often do we hear that foreigners, immigrants or terrorists should not receive the “rights the Constitution grants citizens”? According to the theory that Jefferson was struggling to fit his words to, these questions and claims are nonsense. Nature or Nature’s God endows us with rights. The Constitution protects them, and grants limited power to the government that it creates, that it “constitutes”. § 6. But though this be a state of liberty, yet it is not a state of licence: though man in that state have an uncontrolable liberty to dispose of his person or possessions, yet he has not liberty to destroy himself, or so much as any creature in his possession, but where some nobler use than its bare preservation calls for it. The state of nature has a law of nature to govern it, which obliges every one: and reason, which is that law, teaches all mankind, who will but consult it, that being all equal and independent, no one ought to harm another in his life, health, liberty, or possessions: for men being all the workmanship of one omnipotent and infinitely wise Maker; all the servants of one sovereign master, sent into the world by his order, and about his business; they are his property, whose workmanship they are, made to last during his, not another’s pleasure: and being furnished with like faculties, sharing all in one community of nature, there cannot be supposed any such subordination among us, that may authorize us to destroy another, as if we were made for one another’s uses, as the inferior ranks of creatures are for ours. Every one, as he is bound to preserve himself, and not to quit his station wilfully, so by the like reason, when his own preservation comes not in competition, ought he, as much as he can, to preserve the rest of mankind, and may not, unless it be to do justice to an offender, take away or impair the life, or what tends to the preservation of life, the liberty, health, limb, or goods of another. Interestingly, Jefferson didn’t see the inspirational second paragraph of the Declaration as being all that important. For him, the key purpose of the Declaration was to air and enumerate the grievances that forced the colonies to declare their independence. His first paragraph basically says that declaring independence is a drastic step and we owe to the world to explain why we take it. The last paragraph actual declares independence. The bulk of the document lists the causes, the grievances. The second paragraph is there simply to lay the groundwork for the list of grievances, to set forth the philosophical assumptions and reasoning. It is merely the background. And therein lies its tremendous value. It is a one paragraph summary of the revolutionary philosophical underpinnings of the birth of a nation, the first nation conceived in and dedicated to a philosophy, rather than being an expression of raw power. The Macintosh comes with a service for summarizing any document or text. If you set it to summarize by paragraphs, feed it the Declaration, and restrict it to one paragraph, it chooses the last, but if you set it to two, it chooses—rightly—the second and last. The first is preface, the bulk just a list of complaints. The second is the philosophical grounding and the last is the concrete action. he has waged cruel war against human nature itself, violating it’s most sacred rights of life & liberty in the persons of a distant people who never offended him, captivating & carrying them into slavery in another hemisphere, or to incur miserable death in their transportation thither. this piratical warfare, the opprobrium of infidel powers, is the warfare of the CHRISTIAN king of Great Britain. determined to keep open a market where MEN should be bought & sold, he has prostituted his negative for suppressing every legislative attempt to prohibit or to restrain this execrable commerce: and that this assemblage of horrors might want no fact of distinguished die, he is now exciting those very people to rise in arms among us, and to purchase that liberty of which he has deprived them, by murdering the people upon whom he also obtruded them; thus paying off former crimes committed against the liberties of one people, with crimes which he urges them to commit against the lives of another. And while this section was removed, and slavery continued on for another four score and seven years, the words of that inspiring second paragraph, that all men are created equal, as the great modern orator Byron Rushing has pointed out became the property of others, of posterity and the law, and when combined with the legal reasoning at the heart of Anglo-American Common Law, ultimately resulted in the abolition of slavery, as we could no longer deny that “All men are created equal and endowed by their creator with certain inalienable rights” means just that—ALL people. 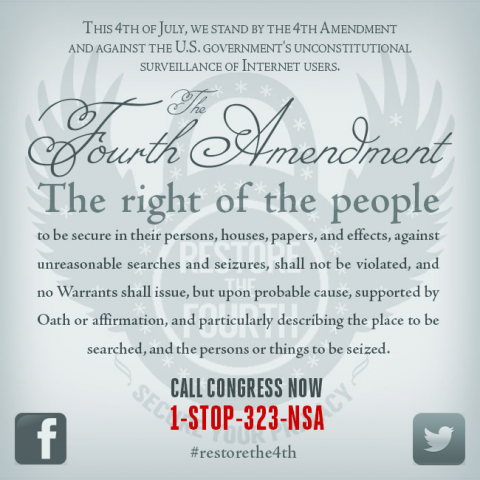 You are currently browsing the Get FISA Right blog archives for July, 2010.